If you have a balcony garden, it doesn’t mean you can’t be creative and do something unusual– Here’re some ideas to inspire you! 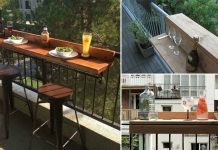 Creating a garden in a limited space like a balcony can be a challenge, it can be hard to think of creative ideas to keep your balcony garden look great while adhering to the strict confines of working within such a small area. However, a balcony garden need not spell disaster for the keen gardener. Instead, you should take advantage of the challenge and opportunity to create a gardening masterpiece out of your garden in a balcony. Choose large containers and if you have a large balcony, grow shrubs. Use the existing structures to climb the climbers. When it comes to balcony gardens, hanging baskets are always a firm favorite. Beautifully-designed hanging baskets offer a universal appeal rarely met by other forms of plant containers, and as such, they have been a constant feature of gardens across the world for many years. Hanging baskets are simple yet striking – they bring delicate flowers and striking foliage up to eye level, brighten up walls and garden spaces, and are perfect for decorating smaller areas like a BALCONY GARDEN. You can make hanging baskets out of any container available at home! A succession of mini hanging baskets can provide the perfect starter option for those who are just beginning to explore their gardening abilities. Also, the idea of using hanging baskets is perfect for balcony gardeners, this way you can use vertical space of your small garden. 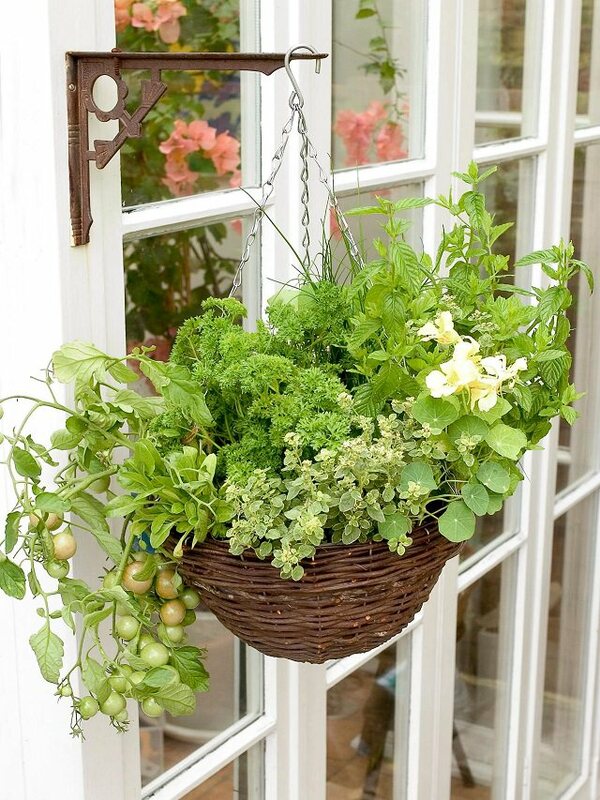 Growing herbs, greens, and even cherry tomatoes is possible in hanging baskets. The beauty of the hanging basket is that it can be continually repurposed and remodeled to suit the changing seasons. Whether they are filled with summer or winter flowering plants, hanging baskets are the perfect solution to provide that much-needed injection of color into the overall look of your garden. When it comes to choosing the perfect plants for your hanging basket, you want bright, vibrant trailing plants for the short-term way to wow, or a creative selection of evergreens for a longer lasting option. If you are a fan of growing your own produce, you could also experiment with using a hanging basket as a miniature herb garden, creating the perfect environment to grow fresh herbs in your own garden! 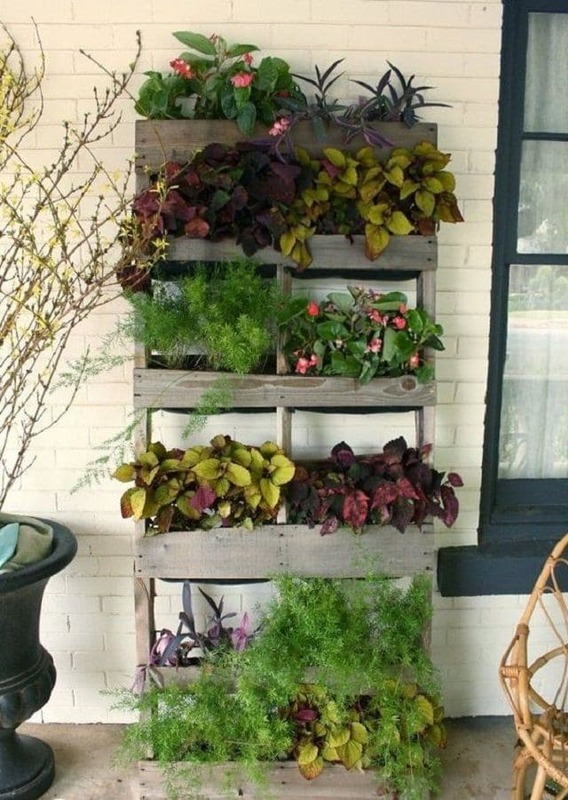 A plant stand or an old book shelf could be a great idea to create more space for containers. 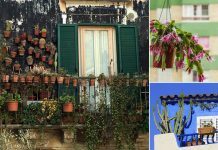 If hanging baskets aren’t really your cup of tea, there are also plenty of other exciting and imaginative ways in which you can decorate your balcony garden. You can have this on your BALCONY! Perfect to hold so many planters; you’ll be able to grow more. Planters are hanging on this wooden bracket mounted on the wall. 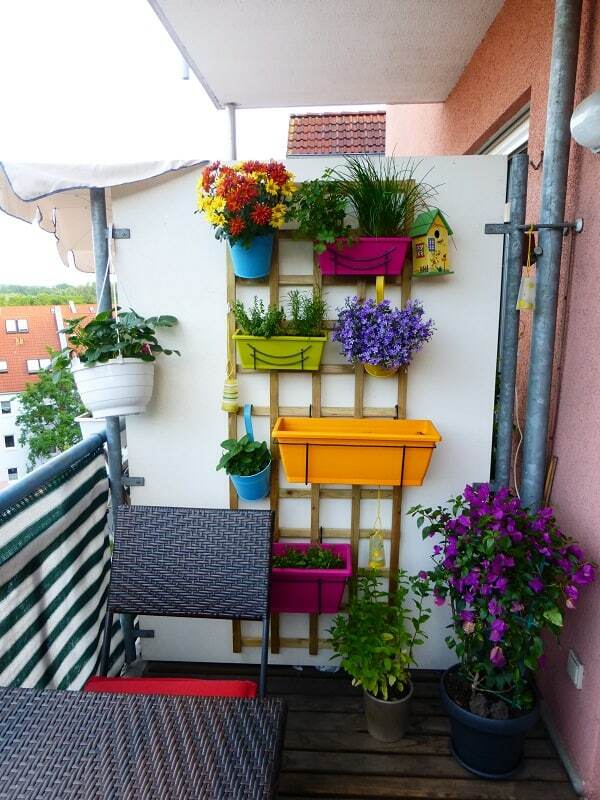 This one is a smart idea for a balcony garden to create more vertical space. If it is a truly quirky and unique garden that you are after, the key is not to let yourself be confined by traditional ideas of the ideal garden. Let your creativity run wild and do plenty of research to ensure that you pick an approach that works for both you and your balcony garden – after all, who says that small balcony gardens have to be dull and boring? 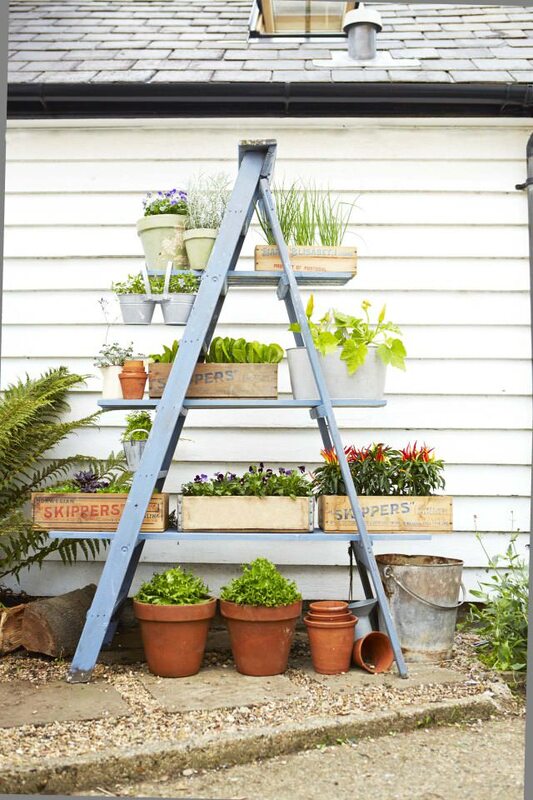 For growing herbs, annuals or succulents, tiered planters are a wonderful addition to a balcony garden! 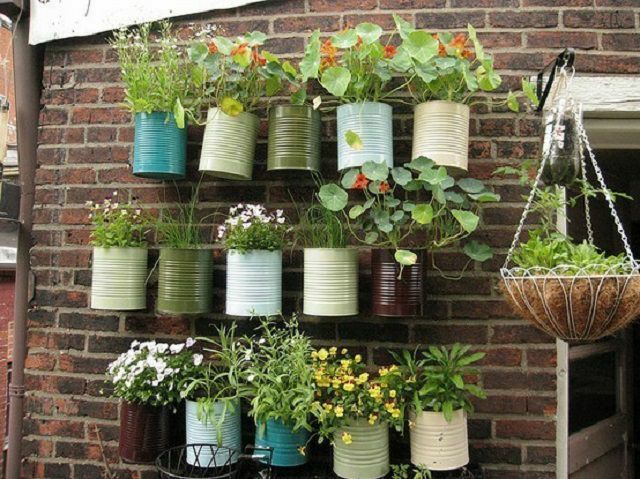 There are also plenty of creative ways in which you can repurpose old items into striking garden containers. 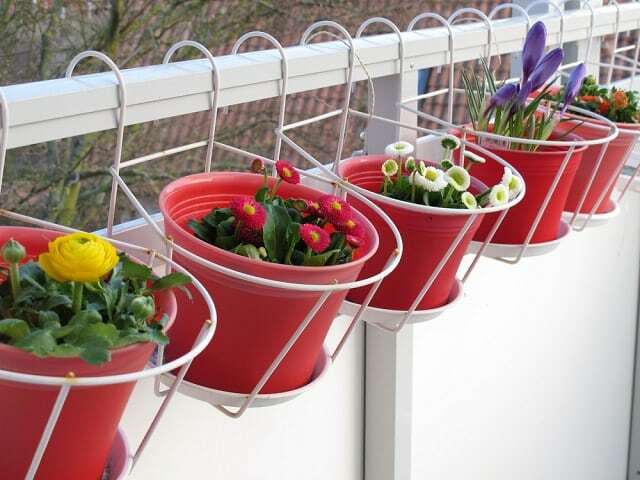 Give old or worn-out pieces from your home a new lease of life decorating your balcony garden in style. 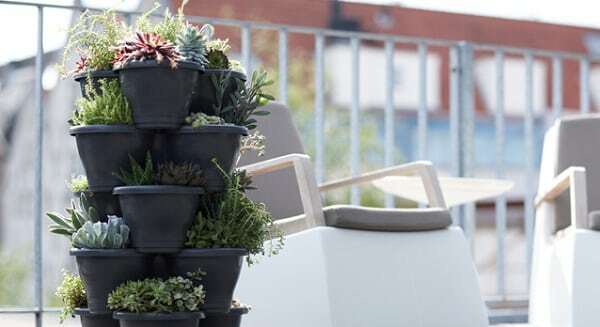 Everything from old watering cans to worn-out boots to empty paint pots can easily become bold and striking new containers to jazz up the look of your balcony garden. 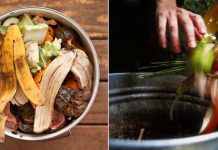 There really are no limits when it comes to finding original ways to use everyday objects in your garden, so get creative and try out some brand new ideas! 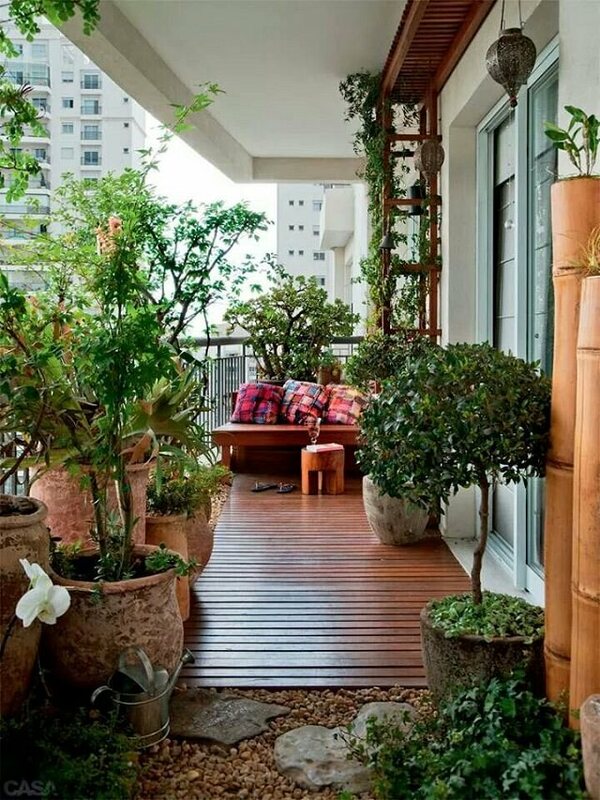 Is your balcony garden still missing that all-important natural, outdoorsy feel? Opt for artificial grass for your balcony garden. 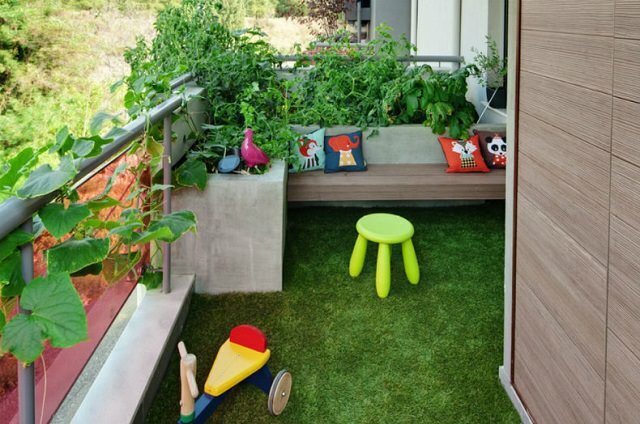 Not the real lawn but it’s a great idea to include artificial grass as a part of your balcony garden design. Good quality artificial grass can add a natural feel to your garden without the need for a large space or real lawn, affording you the best of both worlds. The installation process of artificial grass is also simple, meaning that it could well be the perfect addition to your garden area. 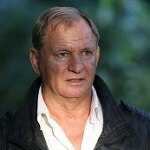 You could also get creative and use artificial grass to cover garden furniture or line planters and hanging baskets to create a truly unique approach. With so much scope to draw inspiration from, coming up with creative ideas for garden containers should be an easy task. Get creative and don’t be afraid to try out new and exciting ideas – your balcony garden will be looking fantastic in no time at all! My name is Martin Stevens, and I am a keen gardener from the UK. I have a passion for gardening, landscaping and the outdoors and I am always on the lookout for fun and creative ways to update the look of my garden. I was inspired by the folks over at Artificial Lawn Company, and I hope to share my passion for gardening with as many people as possible. Thanks for the inspiration Martin! Love these ideas.